The final details of the traffic plan for President Barack Obama’s visit to Ireland on Monday have been confirmed. There will be more traffic headaches in and around Dublin city, while there are road closures too for Tipperary and Offaly for the president’s visit to Moneygall. Meanwhile preparations are in full swing for the rally to be held on College Green on Monday, where Obama will be the guest of honour. Gardaí have also confirmed that big screens are being erected around Christchurch for those who can’t get close enough to see him in person. The stars who will be providing the entertainment in the run up to Obama’s speech have been revealed. 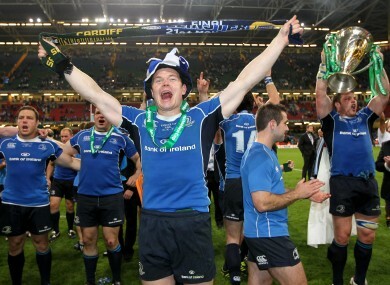 They include Jedward, Imelda May, Brendan Gleeson and Leinster rubgy hero Brian O’Driscoll. People queued outside the Mansion House on Dawson Street today to pay their final respects to former Taoiseach Garret FitzGerald, who died on Friday. He will be laid to rest in a State funeral tomorrow at 2.30pm. Leinster are the Heineken Cup champions after a remarkable win over Northampton at the Millenium Stadium in Cardiff, winning 33-22. TheScore.ie‘s Niall Kelly was there to watch the whole thing, but he still has to make it home. There were no injuries after an explosion on a shopping street in Derry earlier today. The blast happened on Shipquay Street. It’s been reported today that a man who died following a brutal assault in Dublin’s Temple Bar area yesterday may have been killed in a row over a sum of money as little as 70 cent. Singer and owner of impressive eyebrows Chris de Burgh has been told by budget airline Ryanair that it won’t be bullied by him. He wrote to the company in defence of his daughter Rosanna, who is suing Ryanair for defamation. A student has been arrested in Scotland after he was photographed dressed up as Postman Pat carrying a parcel addressed to Celtic boss Neil Lennon. Lennon has received parcel bombs in the past and Lee Dunlop’s fancy dress stunt was not taken lightly by police. A student remains in a critical condition in hospital in Limerick after he was assaulted in the early hours of Friday morning in the city. One man was arrested but has been released without charge. The Queen’s visit was a huge success if TheJournal.ie’s poll on a return trip is anything to go by. Fifty-two per cent of voters would welcome Queen Elizabeth II back soon, while 34 per cent say they’d like to see her again, but maybe not for a few years. Eight per cent of voters feel a visit can wait until the next monarch takes the throne, while 5 per cent would not welcome another royal visit. US President Barack Obama and Israeli prime minister Benjamin Netanyahu sat down together yesterday the meeting was a little awkward. Netanyahu said he rejected Obama’s “unrealistic” view of the region. Today turned out to be NOT the end of the world as we know it, with the 6pm deadline for “the Rapture” passing without incident. A Christian fundamentalist in the US had calculated that today was the day that God would unleash his fury.